So i wanted to make it on Fri Afternoon which was Jas's bday itself, then realised that we needed a cake for our midnight gig with "A Whole New World" -.-" So i decided to bake it on Wed night, so that i can have 1 day to chill it to perfection. So along with my trusty sidekick Ming Jian, and my handy dandy mixer that my mum brought over, got it started. Then a strange smell exuded from the 'powerful' mixer, thought it was someone else burning their dinner. Then the 'all powerful' mixer that is older than me died. So Ming Jian and i looked at each other and we kept the stuff for another day... went to mess hall to eat, had no mood to cook dinner. So Thurs came, skool ended at 5. Walked to Brandon Park, that's bout 30 mins. Looked high and low for a mixer, bought the more expensive one at $30 for fear that i get another 'power mixer', quite impressive: 150 W motor, now that's a mixer. Then ate 2 Big macs (the singapore ones seem bigger) and walked back again (i wonder how i can stand half hour of boredom). 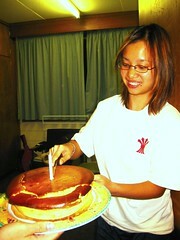 The cake preparation went well, this time with Xing Yi, Jonathan and a little of Jeff. But the mix filled the whole tin, and think we beat the mix a little too much. Think i won't make another cake any time soon, man it's tiring... too bad it didn't turn up as good as the one i made in sg. Lucky huis got a good chunk of it eh? whaahaha you bought a mixer just to bake a cake!!! anyway, just saying HI, weather getting cold, bundle up!